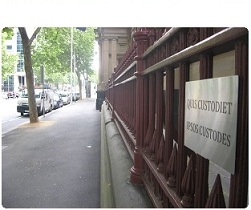 In DPP v Kailahi (2008) 50 MVR 410;  NSWSC 752, the accused was charged with disqualified driving. When the police pulled her over she told them (and the court accepted) she believed she was unlicensed (rather than disqualified). The Supreme Court ruled the claim of honest and reasonable mistake wasn't available to her. I've posted about honest and reasonable mistake a number of times in the last couple of weeks. I suppose the point I'm trying to make is the claim is not the get-out-of-jail-free card it's sometimes claimed to be for strict-liability offences. Proudman v Dayman (1941) 67 CLR 536 tells us that a person accused of a criminal charge should be found not guilty if they honestly and reasonably believed in a state of facts that — had those facts actually existed — would have made their acts innocent when they did the alleged act. There are hurdles the accused must jump if their claim is to succeed. The evidentiary burden isn't hard to meet (CTM v The Queen). But if the accused fails the threshold legal test, the claim of honest and reasonable mistake inevitably fails. A claim of honest and reasonable mistake is not truly a defence, though it's often described as one: He Kaw Teh v The Queen (1985) 157 CLR 523. It's really an assertion that at the time of the offence the accused didn't have the required intent. In the case of an offence of strict liability, it's no excuse to prove that an accused lacked the intent to commit the offence charged but instead intended to committing some other offence. The only other matter that requires attention is the question of whether there exists an honest and reasonable mistake of fact. That, too, is the subject of discussion in Vlahos and He Kaw Teh. In He Kaw Teh, the High Court clarified that, in statutory offences containing no mental element as an ingredient of the offence, except in the case of absolute liability, honest and reasonable mistake survives as a basis of exculpation. It is, notwithstanding common usage, strictly not a defence. Once raised by the accused upon evidence adduced, it is for the prosecuting authority to dispel any doubt that may have been raised by the evidence that the acts performed were the result of an honest and reasonable mistake. However, that does not mean that the mere fact that, in this case, the driver was unaware of the disqualification, is sufficient to raise reasonable and honest mistake. Mens rea, if it were to exist, for the offence of driving whilst disqualified, would be satisfied by an intention to do an act prohibited by the legislature. In this case, the prohibition is upon driving if, as a matter of fact, the driver be disqualified. However, the defence of honest and reasonable mistake applies only in circumstances where, were the facts believed by the accused to be true, the accused would have been guilty of no offence: Bergin v Stack  HCA 53; (1953) 88 CLR 248 (per Fullagar J). In the instant proceedings, even if the Crown were required to negative honest and reasonable mistake as to the existence of a disqualification, such a requirement would only apply in circumstances where, but for the mistake of fact, Ms Kailahi would be entitled to drive. As Ms Kailahi concedes, and as is clear from the conversation with the police officer, Ms Kailahi was aware that she was unlicensed and not permitted to drive. As a consequence, the “mistake of fact”, if it be one, is a mistake as to which offence was being committed. In those circumstances, it is unnecessary for the prosecuting authority to negative or preclude the existence of such a mistake, however reasonable or honest it be.